Ever since Regulation FD (stands for fair disclosure) came into effect in 2000, earnings season has been wild and wooly, especially for the fast-moving growth stocks I focus on, as analysts haven’t been able to get the wink-wink-nudge-nudge treatment from company management. That’s led to lots of surprises and lots of big stock gaps both up and down. Of course, with volatility comes opportunity, for both profit and loss. Way too many investors walk into earnings season unprepared or simply hoping for the best. Eventually that will lead to lots of pain. So today, I thought I’d share with you my five rules for handling (and thriving) during earnings season. I’m certain that incorporating even one or two into your trading will drastically improve your results! Note: I’m repeatedly asked where you can find earnings dates. Unfortunately, there’s no one easy place that I know of—I usually sift through press releases of individual companies to find them, and then relay them in my advisories. 1. Have a plan AHEAD OF TIME and follow that plan for ALL of your stocks. But whatever your plan, you must be consistent—instead of guessing which stocks are going to gap up and which might fall apart, apply your plan to all your stocks and let the stocks tell you which are best to buy more of, hold or sell. Otherwise you could easily find yourself selling the ones that gap up and holding the ones that sink. 2. DON’T buy a “full” position of a stock within a few days of its earnings report. This is just logical risk management. If you want to gamble, hit the craps table (I like buying the 4 and 10 personally!) or, if you must, dabble in some cheap call options. But if you run a concentrated account like I do (about 10% of the portfolio per position), jumping in right ahead of earnings carries no real edge—it’s mostly a flip of the coin. However, if you see a stock with great numbers, an excellent story and a great set-up, you can buy it—but be sure to buy a smaller-than-normal amount (about half your normal size, dollar-wise) if earnings are due out within two weeks. 3. Big earnings gaps are generally buyable—with a couple of big ifs. While most investors have trouble buying a position in a stock that’s just exploded higher, my studies over many years say that big earnings gaps tend to persist in that direction about seven out of 10 times. Some of my biggest winners have come from buying soon after big earnings gaps, including Facebook (FB), which I recommended in July 2013 after a huge 40% move in two weeks. FB went on to quadruple before topping out! However, there are two big ifs that go with buying big upside earnings gaps. First, the market has to be bullish. If the market is in a sharp downtrend and a stock gaps sharply higher, odds favor it will back-and-fill from there, so buying on the pop often leads to short-term losses. Second, the gap has to be decisive—if a stock rallies 3% or 4% on earnings, that’s nice, but it’s not showing jaw-dropping power either. To be a buyable earnings gap, the stock should move at least 6% or 7% (for a big-cap stock) or 10% or more (for mid caps and small caps) and soar clear of resistance going back many months. Also, it’s better (though not 100% necessary) if the stock is blasting out of a consolidation period. In other words, if the stock hasn’t done much over the past few months and then soars, it’s better than if the stock has been running higher for the past three months and gaps. Obviously, the bigger the gap, the harder it can be psychologically to buy the stock. If you have issues with that, consider buying a smaller amount and use a looser stop, giving your position room to consolidate if it has to. 4. When your stock gaps down, continue to follow your sell plan. While upside gaps often provide buying opportunities in new leading stocks, downside gaps should be placed in context with the stock’s chart and overall action. For example, if a stock gaps down 7% on earnings but holds near its 50-day line, it probably should be given a chance—one bad day doesn’t crack the uptrend. On the flip side, though, if a stock does gap down in a big way below your stop, you should get out—don’t simply hold and hope for a bounce. Those big gaps lower can lead to immediate and big losses. And don’t kick yourself too harshly if this occurs; simply put, if you invest in aggressive growth stocks, you’re going to get stuck in the occasional implosion. The key in that unfortunate situation is to make sure a bad situation doesn’t get any worse. The bottom line, though, is that you should stick to your sell plan no matter what your stock does on earnings. 5. Don’t predict earnings—but watch for these two factors. We don’t predict earnings because a stock’s reaction is mostly a roll of the dice. However, there are a couple of things we do take note of before a company reports. First, we ask if the stock has had any meaningful corrections during the past five or more months. “Meaningful” is admittedly subjective, but usually we’re talking about a four-plus week retreat that takes the stock down 15% or more and below the 50-day line. If a stock has been kiting higher for five-plus months, it’s fair to say there is some pent-up selling pressure and expectations for the quarterly report are high. Second, we look at the stock’s reaction to its past three reports. If all three led to an immediate gap up (even only 3% or 4%), it’s also likely that expectations are elevated heading into the current report, which raises the prospects of a poor reaction. Even so, if these two criteria are met, it doesn’t mean you should sell out of a stock ahead of earnings. But it does give you a heads up that risk is high. On the other hand, it’s good to keep an eye on stocks that are in longer-term uptrends but have been building new launching pads during the past few weeks, thus shaking out some weak hands and raising the odds of a positive earnings reaction. Or, even if a stock is in an uptrend, I like to look for relatively “early stage” stocks—those that just got going a few weeks ago, meaning there are still plenty of investors who want in, so if the numbers are well received. As earnings season revs up, I have two ideas on that front. The first is PayPal (PYPL), which is the best way to play the digital payment and money transferring movement. Whether it’s the firm’s namesake offering, Venmo or Xoom, the company is far and away the leader in this long-term growth area. And the numbers show it—sales and earnings are cranking ahead in the 15% to 25% range, active accounts are huge (254 million) and growing (up 15% in Q3), and total payment volume is kiting higher (up 25%). Moreover, PayPal continues to ink deals with merchants (both online and offline) to extend its reach. It looks like a liquid leader to me. The stock has effectively been consolidating for the past year (no net progress for 11 months), and I like the fact that the stock hit its correction low in early October, way ahead of the market. Now PYPL has popped back toward its all-time highs; a little rest here could set up a potential breakout on earnings when the company reports on January 30. 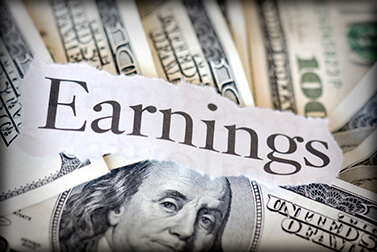 Another name to watch this earnings season is Xilinx (XLNX), which for years has been a relatively successful (but sleepy) chipmaker, but the top brass has more recently emphasized growth markets like those that speed up data centers and networks (including 5G), which has made a huge difference—sales and earnings growth are both accelerating (up 19% and 30%, respectively, in Q3) and have easily topped estimates in recent quarters. The stock was looking done for in October, but the reaction to that Q3 report sent it skyrocketing four weeks in a row on big volume. Since then, XLNX has built a tidy seven-week launching pad—earnings, which are due out January 23, could be a catalyst if they please Wall Street. Whether PYPL or XLNX react well to their reports or not, the larger point is that new leadership almost always emerges during earnings season. And as it does, I feature the stock in Cabot Top Ten Trader, whose my job is to find out where the big money is flowing. Every week I bring subscribers the strongest stocks in the market, give exact buy ranges and loss limits and provide follow-up advice going forward. If you want to buy the market’s new leaders as they get going—during earnings season or otherwise—click here. aggressive growth stocks, big cap, big cap stocks, buy the stock, cabot, cabot top ten, cabot top ten trader, call options, early-stage stocks, earnings, earnings gap, earnings season, election, FB, growth stocks, invest, investors, leading stocks, LOW, M, mid caps, oil prices, options, share, shares, small caps, stock, stock market, stocks, strongest stocks, the stock market, trading, volatility, volume, wall street.